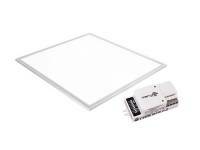 Motion sensor PIR human body detector LED panel lights for wholesale from top rated motion sensitive LED panel lighting manufacturer in China, available in square, rectangle, round shape with optional color of cool white, warm white, natural white. In accordance with CE, RoHS, GS, SAA, FCC, CQC certificates, we provide 3 – 5 years factory warranty. The motion sensor has a switch, which turns on the light upon detection of people movement, and turns off after a pre-set hold time when there is no people around. A daylight sensor is also built-in to switch off the light when there is sufficient natural light. The motion sensor detects motion up to 6 meters, the rated output wattage, hold time, standby time, brightness, LED brands, package can be customized.